"Coach Mary is amazing! She got me ready for my very first triathlon at age 40 with a fantastic training plan, superb coaching, and incredible patience. I was really nervous about the swim portion of the race, but Mary worked tirelessly with me to get me ready (both physically and psychologically). Coach Mary not only prepared me for the swim, but provided valuable tips on cycling, trainsitions, and running. On race day, I felt very prepared and thoroughly enjoyed the experience. I cannot thank Mary enough for helping to make this first experience so terrific! I continue to work with Mary and plan on enjoying more triathlons in the future!" "Mary is an amazing coach and possibly the nicest person I know! She helped me conquer my extreme fear of water so that I was able to compete in my first triathlon. She is supportive, enthusiastic, patient and honest. I like to train hard and her sessions were so much fun that I barely noticed the pain. I feel honored to have been able to benefit from her wealth of knowledge and train with such a legend. I placed 13th overall in that first tri and I couldn't have done it without her. p.s I can now change my own tire too!" 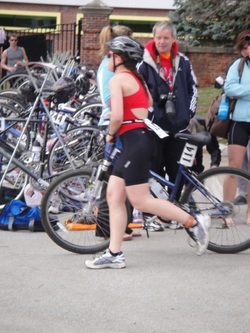 "I trained for my very first triathlon with Mary, and I could not be more pleased. Mary is a patient, kind, understanding coach who is very knowledgeable about the sport. She was open to any questions or concerns and was careful to prepare me for every aspect of the race. I learned how to transform myself into a triathlete, as well as cardio, strengthening, and stretching skills that I will take with me through life. Most importantly, Mary strove to instill confidence in me as an athlete. When I first thought of training for a triathlon, I didn't think I was 'triathlete material.' A former Varsity Track athlete, I couldn't imagine racing for more than a half hour! 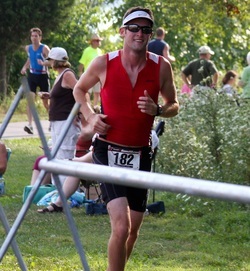 I ran the last half mile of my triathlon with a huge smile on my face. I would reccommend that anyone who wants to experience the greatest feeling of self-accomplishment should train with Mary." "Mary has been my coach for the past few years. She introduced me to the sport of triathlon and has helped me evolve as a triathlete. She's an accomplished triathlete herself, so her input comes from an earned knowledge of how to finish, compete and excel in racing. In addition, Mary is a genuinely sweet, amiable and fun person. She's a phenomenal coach and an inspirational person to be around." "As a first-time triathlete, I did a lot of worrying (and I had a lot of silly questions)! But Mary was absolutely wonderful; she kept me calm, answered all of my questions, and was inrcredibly kind throughout the entire process. I never felt disadvantaged, or "behind," because I lacked a strong athletic background. I did feel like I was being pushed, but I felt great about myself (and very confident!) throughout the entire process. The time that I spent with Mary, and the plans that Mary wrote for me), had me totally ready for race day. I arrived feeling prepared, confident, and excited -- and I had such a great time that day, I decided to start a triathlon club at Haverford College. I knew I could trust Mary, as I'd had a wonderful experience with her -- so we brought Mary on board as our club's coach, and we're so glad to have her around!" 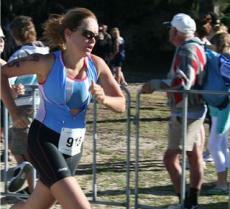 "Mary has been an integral part of my success in triathlon this year. Her training plans are always well thought out and I have seen instant improvements in my training and performance, having already shattered last year’s race time by over 40 minutes! Mary routinely goes above and beyond all expectations and her positive attitude and knowledge of the sport inspires confidence and success. Whether you are new to the sport or looking for that added boost there is no doubt Mary can provide you with the training necessary to accomplish all of your goals!" "It was a real pleasure having the opportunity to work with Mary. This was my third year as a triathlete, and by far my most successful year as I broke my previous year's PR by 20 minutes! Prior to triathlon I was never a swimmer, runner, or biker and it was because of Mary's guidance, motivation, and knowledge of the sport that I was able to stick with my goals and accomplish them. I finished several races with Mary as my coach including my first 70.3 in the Pocono Mountains! It was because of Mary that even during the half marathon run of the 70.3, I was able to keep a smile on my face the whole way through it. It felt great, and it is a huge accomplishment. I cannot wait to see what next year has in store as I continue to advance my skills and race for a new PR!!!" "Coach Mary - Thank you so very much for preparing me for the SheROX Philadelphia Triathlon, and coming out and supporting me! It really meant a lot and kept me motivated the whole time. I didn’t know what to expect or how I was going to feel, but I ended up feeling great and having fun, thanks to your expert guidance and training plan. 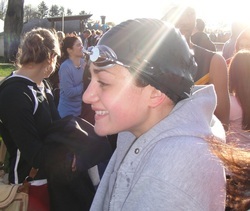 I started to cry when I got out of the water, I can’t believe I did it!" "Mary was a fantastic trainer! 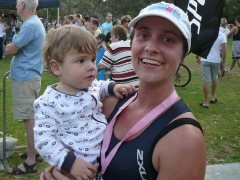 Having met Mary in my first ever triathlon training program, she was amazing at helping me achieve my novice goals. From a person with no triathlon experience or training, Mary's pleasant manner, knowledge, thorough feedback and monitoring kept me motivated to complete three triathlons in one season with confidence and focus. We miss Mary in Australia!" 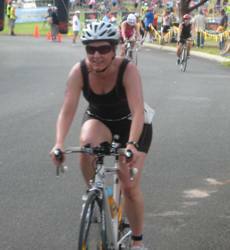 "Mary was my running and cycling coach at a women specific triathlon training course in Perth Western Australia in early 2009. Mary has a true passion for triathlon and is a talented coach who knows how to inspire and motivate each individual to achieve their best. Not once did I dread waking up at 5.30am to attend early running and cycling sessions in the dark of winter because they were so enjoyable. Mary kept the training sessions interesting with a variety of different drills and her positive attitude made it a joy to attend sessions. We were sad to see Mary depart back to the States but wish her all the best. I encourage anybody thinking about signing up with Mary to go for it because you won't regret it." "We met at 6am all through winter 2009 and Mary was bright and enthusiastic on the dark early mornings and always equipped with a varied program to challenge us. She was very encouraging and inclusive of everyone in the group, which included a wide variety of levels and abilities. I was really sad when Mary left us to move overseas, however I felt very confident in the training which she had provided. 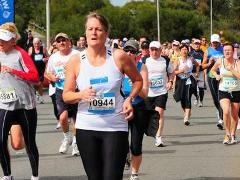 I went on to complete a personal challenge, the 12km City to Surf run, in a very rewarding time and was pleased to have been so well prepared." "Mary helped me learn how to swim and conquer my fear of water to prepare for snorkeling on my honeymoon and as part of a cross training program for running marathons. She also ran parts of my long runs with me to help keep me motivated. Because of my training with Mary I was able to shave 40 minutes off of my marathon time. She is a great coach and a wonderful person." 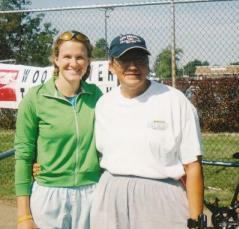 "My coach and great inspiration was Mary Kelley. Without her my road races would never have been as accomplished as they were and when I decided to try a triathlon she said from day one – you can do this. She taught me it is not about the speed or my time but about the true passion I felt for the sport I was participating in and she tapped into the source of my desire and helped me get overall more accomplished. Mary is a thoughtful person, a wonderful coach and someone I admire because she leads us all by her example."